Flickr photos by Ken McCown, a designer and professor of architecture and landscape design. 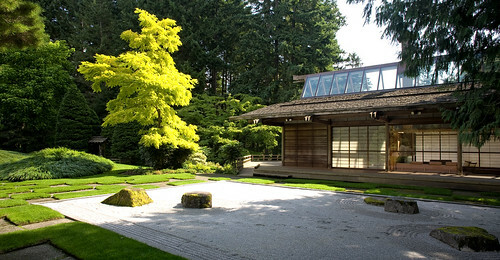 This is a beautiful Japanese-influenced guest house by architect Paul Hayden Kirk (1914-1995) at the Bloedel Reserve in Seattle. It seems to be halfway between a Case Study house and a traditional Japanese farmhouse. In the western world, 750 sq ft apartments can seem really small, even for just two people. The excerpt below is from an interesting article by Nold Egenter, a Swiss architectural anthropologist, on the cultural influences that allow the Japanese to live comfortably in what North Americans would consider small spaces. Sometimes after seeing too many chichi, precious, and citified houses, too much shiny, overproduced design, and everything just starts to look too estranged from the materials it was made from, as an antidote I go look at pictures of handbuilt houses. People can dismiss these as “hippie houses,” but the evident Japanese, Scandinavian and other architectural influences actually ally these buildings with the traditional rural house as well as with modernism. The beautiful Sleeping Cottage on Lake Huron, Canada, by Mos, 2003-4. Many people may already have seen Mos’ Floating House on Lake Huron. Mos is an architectural firm that in their own words is “a collective of designers, architects, thinkers, and state-of-the-art weirdoes. The two principals, Michael Meredith and Hilary Sample, teach at Harvard University and Yale University while maintaining their practice.